CBS Sports finally went the Mike Pereira route this year by hiring a full-time former official to be their rules expert. Former referee Mike Carey made his debut on Sunday… and it’s apparent he has a ways to go before he becomes as comfortable on TV as Pereira. Here was his first interaction with the top broadcast team of Jim Nantz and Phil Simms from the CBS studio. As far as debuts go, it falls right behind Chuck Giampa’s epic Showtime bow. Carey looks like he’s being held hostage off stage and you can audibly hear a producer yell at him to start talking. After that, there’s some confusion over what exactly the ruling should be. It’s only going to go up from here for Carey and CBS. If there was one referee you thought would be good for this job it would be him. On the bright side, we can still marvel at the fact that he’s the best looking 64 year old walking the planet today. 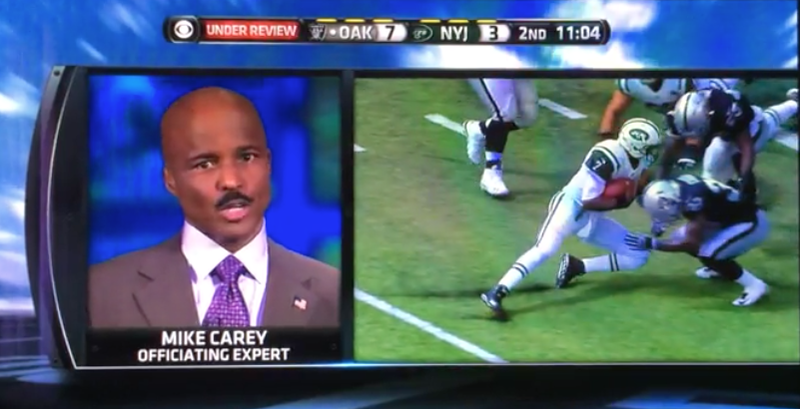 Pingback: Should Mike Carey be predictive, or opinionated?